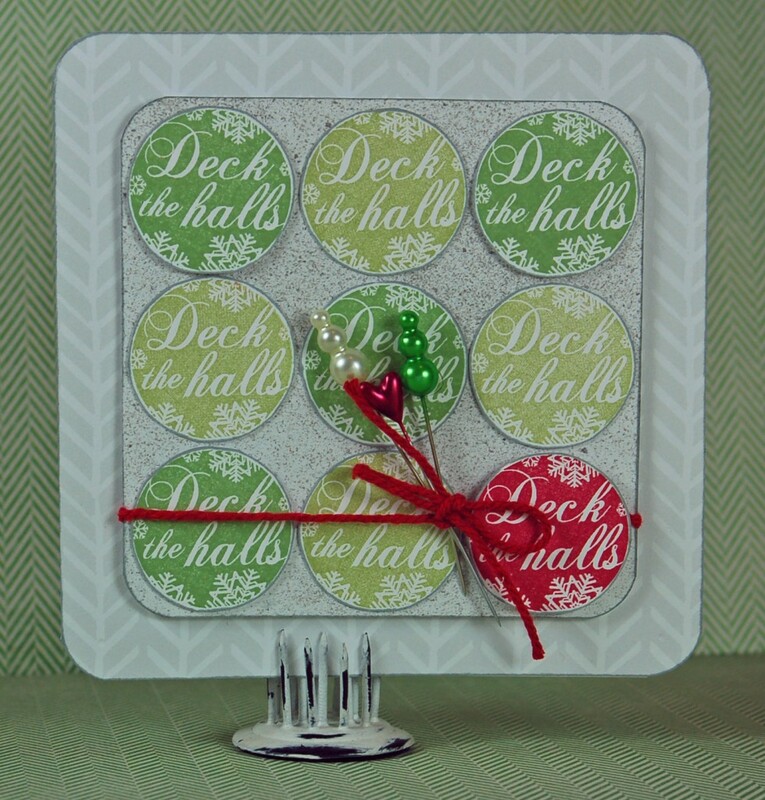 30 Days of Holiday Projects – Post #2! It’s that time again already! 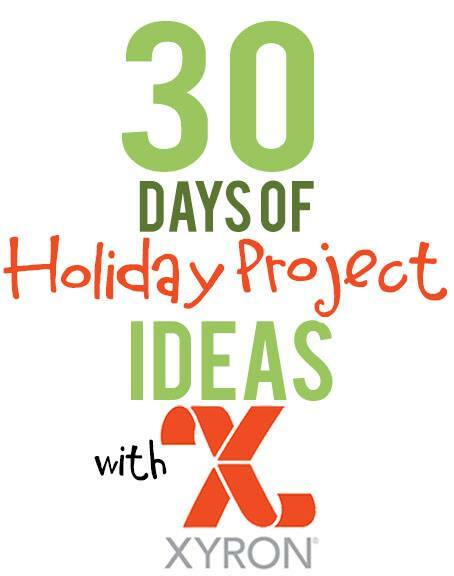 I love that Xyron is doing this 30 days of projects and inspiration, and it is so much fun to be a part of. The girls on the team have been making so many amazing things that I find myself thinking that I need to make a trip to the craft store for some of the supplies they’re using. Goodness knows my husband loves that 🙂 Anyway, head to the Facebook page to see more links and photos. Today is the first day of December, and that means it’s card time! I like to send mine out Thanksgiving weekend (usually), but this year has just been too crazy. I’m actually going to take photos of the family next weekend and send out cards after I get those back. 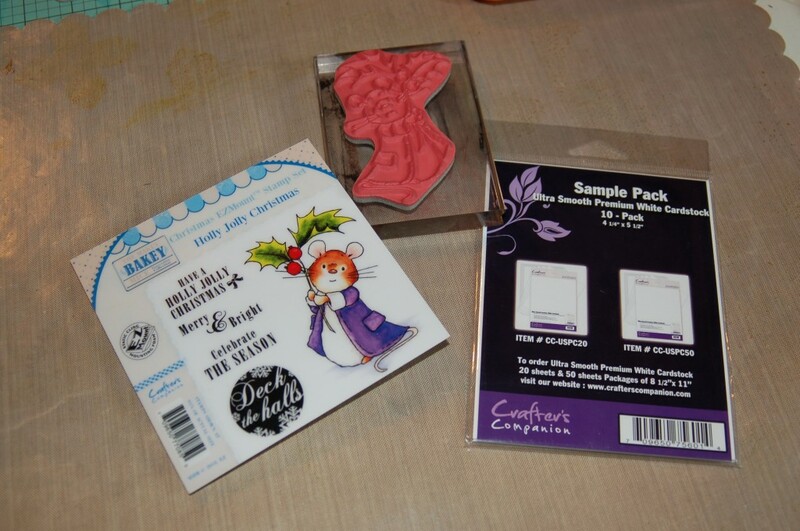 The secret with handmade cards is that you have to make them easy to make a ton of (I send out around 70 every year), and you have to keep costs down. There is no better way to keep you costs down and make things easy than to use stamps! 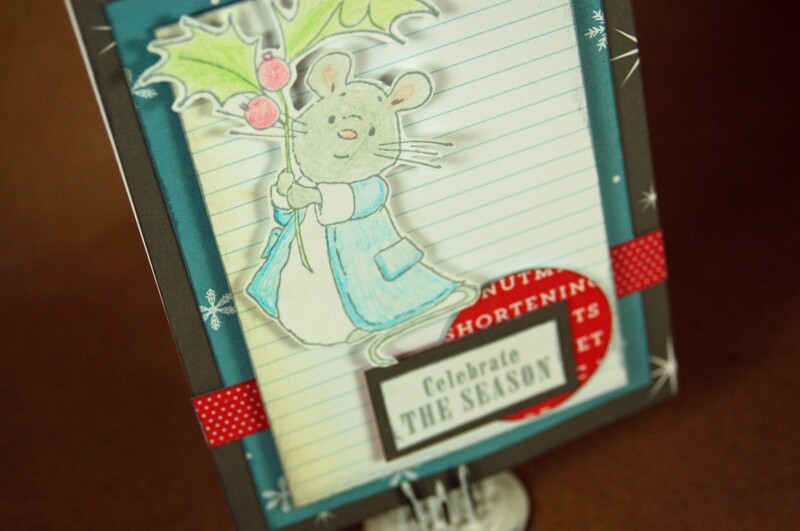 Let’s talk about that cute mouse card first. I do have a little bit to talk about there. Anyway, here’s a look at the stamp set, the papers we were sent to stamp on (greatness) and what the mouse image looks like on a block. 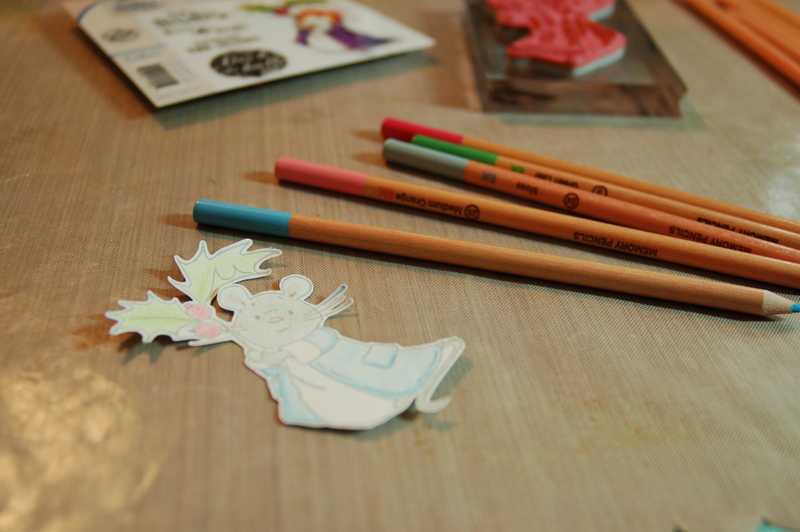 And this was after my little mouse was all cut out and colored. I do like to color. Very relaxing. 🙂 As for the rest of the card, it’s all about layers. I used two different American Crafts papers in the background, cutting them to fit my card base and then a little smaller for the next layer (I usually do an inch or half inch difference depending on how much of a reveal I want). The lined paper is actually part of a page of cards that I cut up, and it helps keep things from looking too busy. The mouse and the sentiment were stamped on that amazing white cardstock, the mouse was hand cut and the sentiment I just used my trimmer for. I punched another shape to add some interest behind the sentiment and things were layered together with my Xyron 510 (for the base), my Mega Runner (flat layers) and homemade foam adhesive (for popped up pieces and interest). It was quick to put together and don’t forget, once you’ve decided on the design, you can make a bunch of everything and just stick it all together. This other card is even easier (you know I love that because I can’t stop saying it). I knew that I wanted to make something like this as soon as I saw that round stamp in the package. All I needed to do was choose a few different green ink pads, a red ink pad, some twine and some pins. Let’s look at that one again. Here it is all broken down. 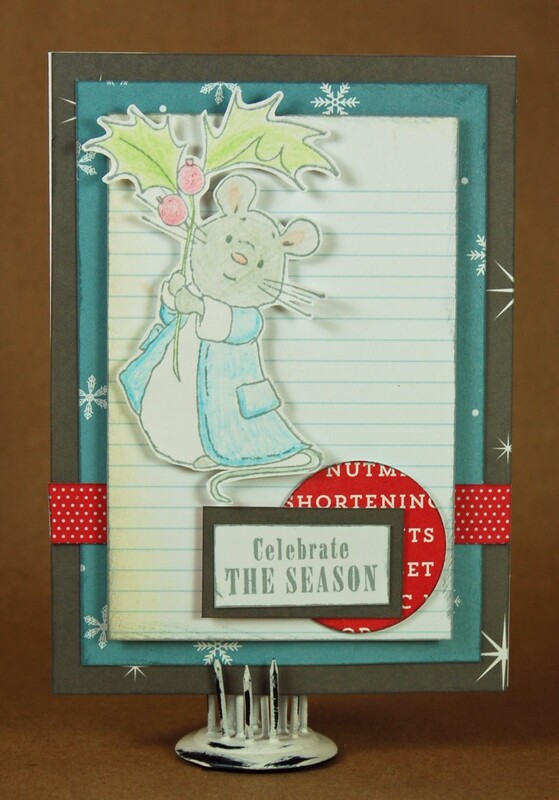 I attached a background layer of patterned paper to my card base with my Xyron 510. I trimmed a piece of white cardstock to one inch smaller than the base, then I rounded the corners and misted it with some silver mist. (The edges are all inked with grey ink). I stamped a bunch of different shades of green to make my circles until I had a set-up that I liked, and I added a red one for interest. Those are all attached with 3/8″ Adhesive Dots, and then I tied a piece of Maya Road twine around the whole thing. I attached this piece with some homemade foam adhesive, then I stick some pins through the bow. Those are all Maya Road pins, and they make some gorgeous stuff. 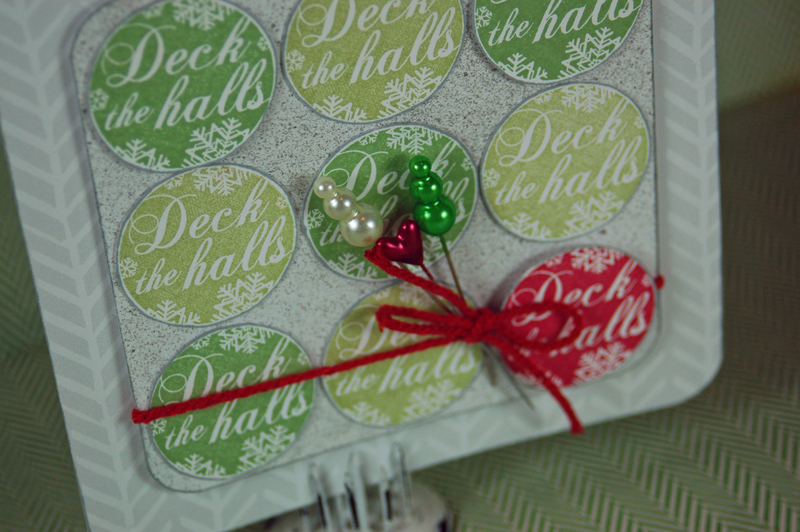 I also tacked those pins in place with some of our smaller Xyron Adhesive Dots. They’re perfect for things like this. Well, that’s it for the how-to. Again, sizes of cardstock and papers will depend on the size of your card base. Be sure to look into postage costs before you make all your cards (sometimes different sizes cost more money) and think about things like the thickness of the card for mailing. I prefer to give the extra fancy handmade cards to my local peeps and those that I give trays of cookies to, and then to mail flatter cards to family that is far away. I hope you’re finding yourself inspired every day by these posts from Xyron. Have a great week! I’ll be back in a few days with another little something I made for this year’s holiday decorations. Previous postI’ve been going home-improvement crazy!